Sophisticated yet charming, this architectural gem is located in the heart of the Main Line within walking distance to Suburban Square. 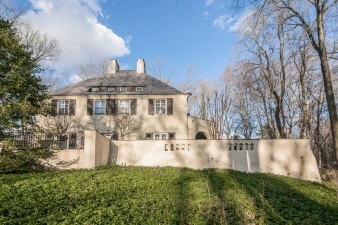 Custom built in circa 1925, this extraordinary European home designed by and built for architect John Irwin Bright and his family, is embraced by beautiful slate terraces and custom designed gardens. Bright was inspired by his travels to Morocco, and his time in Paris. The home was completely renovated with style and grace using the finest materials by the present owner.